It’s good to be a multihull sailor these days. Advances in materials and design have not only revolutionized the market, but it seems the innovations just keep coming. 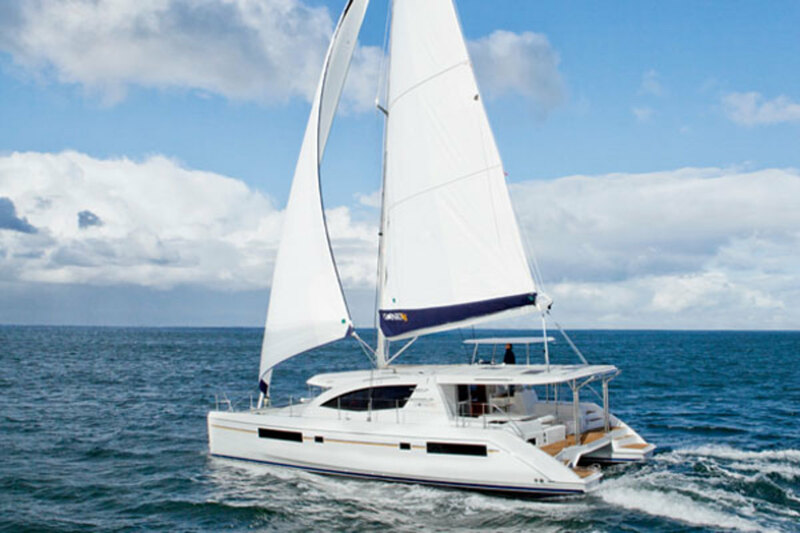 Case in point: the Leopard 48, a boat that employs the latest in catamaran thinking to deliver a platform that is as fun as it is comfortable. Designed by Simonis-Voogd and built by the veteran South African yard of Robertson and Caine, the Leopard 48 (also available as the Moorings 4800 for those interested in charter ownership) is one of four well-constructed Leopards (five, if you include Leopard’s powerboat) ranging in length from 39 to 59 feet LOA. Like the rest of the line, the Leopard 48’s hulls are vacuum-bagged with a balsa core to maximize rigidity and minimize weight by carefully regulating the amount of resin in the layup. The boat’s shallow keels are filled with closed-cell polyurethane foam to prevent water ingress and increase buoyancy, and the bow and stern both have sealed bulkheads to keep the water out in the event of a collision—a good idea for a boat built with bluewater passagemaking in mind. The hulls are deep and narrow below the waterline, but curve outward higher up, joining the slab-sided topsides outboard along a distinct chine. As a practical matter, this reduces wetted surface area, but still provides plenty of room for accommodations and deck space. The flare in the hulls also helps deflect spray and creates a good deal of reserve buoyancy for when the boat is hard pressed. According to the delivery captain who sailed our test boat up from South Africa, the Leopard 48 more than proved its worth during one heavy-weather stretch when it regularly hit over 17 knots for hours on end, never once burying its bows in the troughs of the heavy seas. I was a little surprised at how boxy the design looked when I studied some drawings of the boat after my test sail. In the flesh, so to speak, the curves that define the cabintrunk, transom and chine combine with the more angular shapes of the nearly plumb bows and a series of rectangular hull windows and hard “roofs” over the helm station and cockpits to create a look that is purposeful, attractive and far more “horizontal” than the drawings suggest. I found it vaguely reminiscent of the Hanse monohull line—of which I’m a big fan. The complexity of the tooling required to make a good multihull deck never ceases to amaze me, especially aboard a boat as well put together as the Leopard 48. 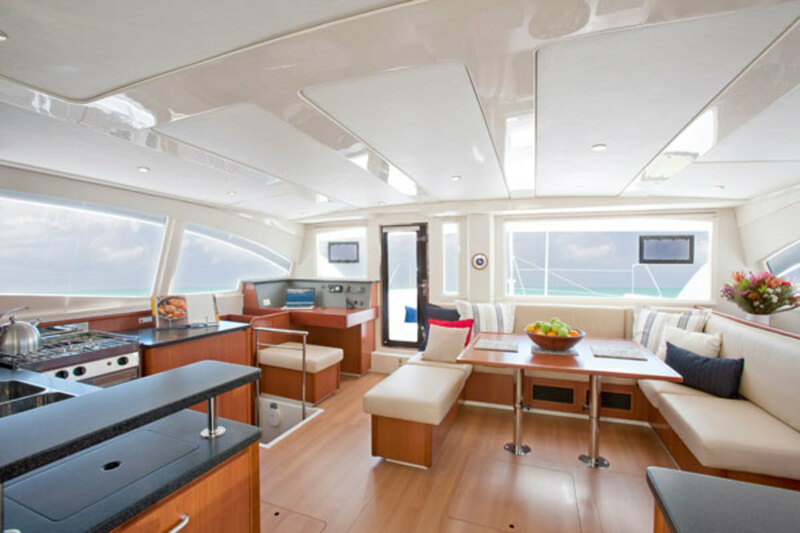 For the loungers in the audience, a clever forward cockpit—which Robertson and Caine introduced on the Leopard 44 (SAIL magazine’s Best Boat 2012 winner in the cruising multihull category)—provides a great place to relax and watch the world go by. This concept has been further developed with a set of steps that open out onto the bows and a sliding overhead hatch in the forward roof to help you avoid banging your head. The main cockpit aft is not only comfortable but provides free and easy access to a pair of wide-open side decks. These, in turn, feature flush-mounted hatches and hefty toerails/mini bulwarks to ensure a safe passage forward. I especially liked the wealth of stainless steel handholds along the cabintrunk—something that is missing on far too many cruising multihulls. Another feature I really liked was the large transverse passageway aft, which allows you to cross from one hull to the other or hoist the dinghy back into the boat’s davits without bumping into any of your passengers. The saloon on the Leopard 48 may differ from what many sailors are accustomed to, because of the doorway smack in middle of the cabintrunk leading forward. However, by making this door glass—so that the view is unobstructed—and flanking it with a forward-facing nav station to port and a large table and settees, Robertson and Caine has created a layout that is spacious, comfortable and extremely well ventilated. Belowdecks in the two hulls, the combination of the topsides flare, large hull windows and multiple opening hatches results in a series of wonderfully large, airy and well-lit cabins. It really is incredible how much air and ambient light is available in the Leopard 48’s living spaces compared to what multihull sailors aboard production boats of this size had to endure in the past. I especially like the small opening hatches in the aft cabins looking out over the swim step. Never mind the cross ventilation, it’s just plain fun being able to sit up in your bunk and look out at the wake spooling out behind you when sailing. A four-cabin layout is available, as is a three-cabin version, in which the starboard hull is given over almost entirely to the owner’s accommodations. There is also room for additional crew accommodations in the bows. The trim and woodwork is composed of cherry and cherry veneers. Overall joinery quality and workmanship is excellent. While you’d never mistake the Leopard 48 for a racing cat, the boat still provides more than enough get-up-and-go for some very fun sailing. In 10 knots of wind, we managed a respectable 8-knots-plus close reaching through a light chop and were able to maintain 6 knots of boat speed at an apparent wind angle of 45 degrees. Equally important—if not more so—was the feel of the helm, which was not only responsive but provided a satisfying amount of feedback when playing the shifts, something that is often missing from a cruising multihull. Coming about, the boat did just fine, although I did get a little tangled up trying to coordinate the double-bridle mainsheet arrangement. 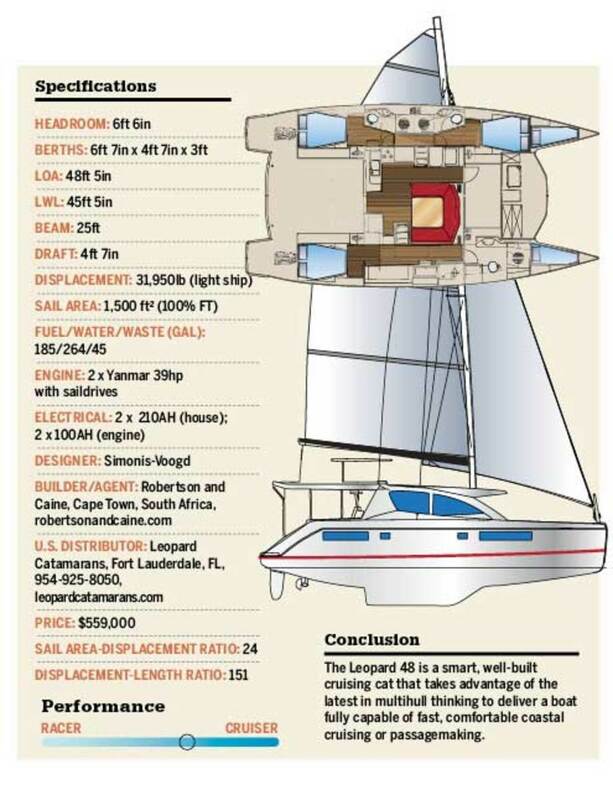 Call me old-fashioned, but I prefer a more conventional mainsheet and traveller. That having been said, the bridle arrangement is not only robust, but makes it easy to fine-turn your mainsail shape. The boat’s motion in a chop was easy and predictable, suggesting it would provide a comfortable ride offshore as well. Those cruising aboard the Leopard 48 would be well advised to keep their onboard gear (read: additional weight) to a minimum in order to take full advantage of all this boat has to offer. No surprises here: at 1,000 rpm, the boat’s twin Yanmars moved us along at a good 4 knots. Increasing the rpms to 2,000 yielded 6.9 knots, while at 2,500rpm we made 8.1 knots. The Leopard 48 spins about effortlessly when you work the throttles, just like a good cat should.